This spider was photographed using a Nikon CoolPix 990 in Aug. 2002 in Phoenix, Arizona. A tachinid fly is it's prey. Which creature has Nature's most sophisticated eyes? Birds of prey? Humans? Cephalopods? Amazingly, Jumping Spiders are certainly in line for this distinction, especially given the miniaturization of the optical lenses and mechanisms. Vertibrates adjust the shape of the lens through stretching and compression to accomodate focus, but jumping spiders instead move the retina (the light sensitive plane), a choice also made by camera manufacturer's. 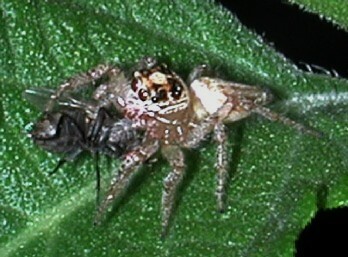 Jumping Spiders are active hunters walking and jumping across their terraine in serch of mostly soft bodied prey. Movements attract their attention and if they identify movement as a potential prey they maneuver stealthily into position before leaping onto the prey. When not hunting they hide within a silken retreat. Several species of jumping spiders are common in the Sonoran Desert and are most frequently encountered in spring and again in summer after rains have started.